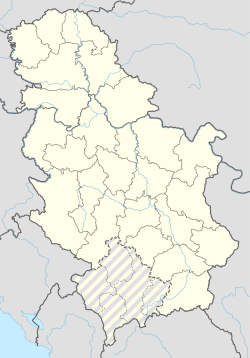 Farkaždin (Serbian Cyrillic: Фаркаждин) is a village in Serbia. It is located in the Zrenjanin municipality, in the Central Banat District, Vojvodina province. The village has a Serb ethnic majority (94.94%) and its population numbering 1,386 people (2002 census). Names in other languages: German: Farkasdhin, Hungarian: Farkasd. This Central Banat District, Vojvodina location article is a stub. You can help Wikipedia by expanding it. Wikimedia Commons has media related to Farkaždin. This page was last edited on 28 February 2019, at 04:06 (UTC).